I've been running a bit behind with the Autumn collections dance - so while Christmas collections are already rolling out, I'm still rocking the Autumn vibe. It also helps that there are only a handful of Christmas collections I actually like - last season (well, this season actually) held many more gems. 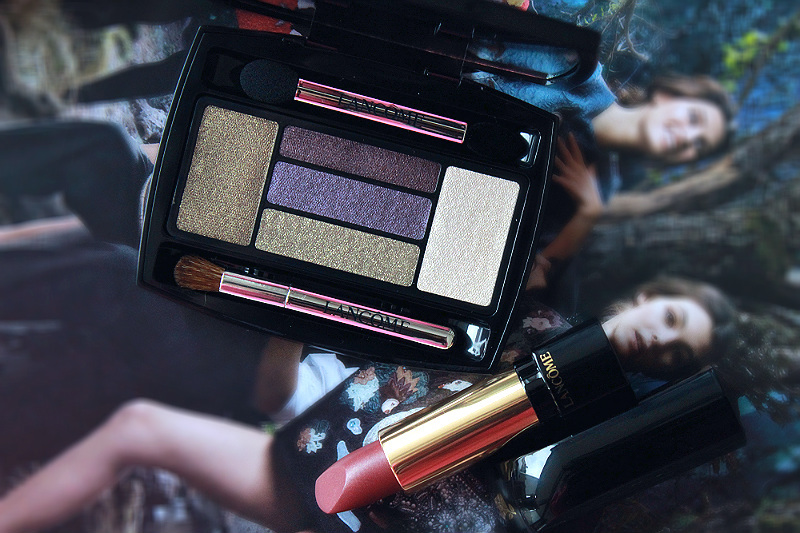 Lancôme played with amethyst and golden green shades for their French Idole collection, an ode to the modern and effortlessly chic Parisienne. Judging on some pictures I found online the collection looks a little different in the US (although the shades in the main palette are the same) so what you're seeing is the European version of things. I went all out with this palette - nothing beats a good dose of gold(en green)! Straight from the Lancôme HQ to my underarm: the Hypnôse Palette in Malachite & Améthyste & the Le Rouge Absolu in Rouge Agate Sheer. The darkest shade swatches a little powdery, but on the lid these perform fine and leave no fall-out. They're not buttery smooth in texture, but perform just fine using the right techniques. The pigmentation on all of these is beautiful - you can go from sheer to pretty opaque with these, depending on how you use them (wet or dry). The highlighter shade is very, very pretty - it really pops out. It's great to highlight the inner corners of your eyes to add brightness to your whole look. You'll find that using shades like this to highlight really opens up your eyes - it's the perfect finishing touch. In this palette I love the lightest gold/khaki shade the most - it has big glittery gold particles in it that are just beautiful when used wet. The two purply/plum shades look just slightly different and blend together to one colour when used together - I wish the shades in this little palette were a more versatile, so they'd stand out more from each other. 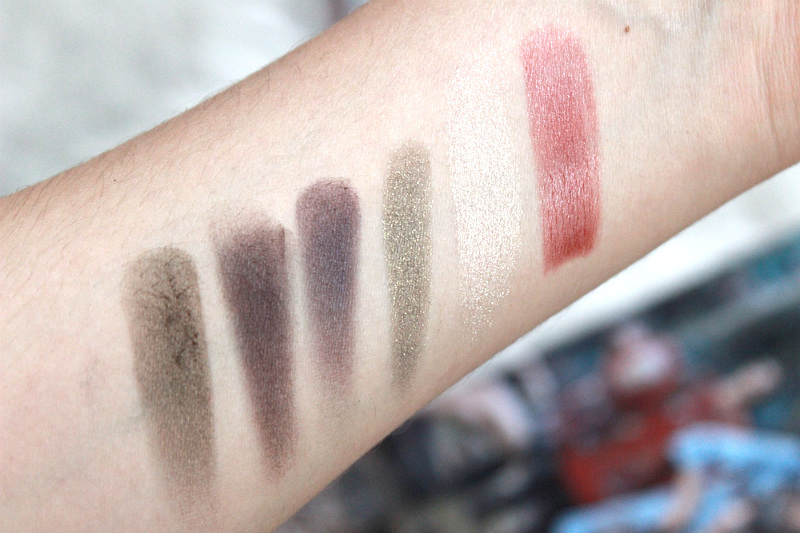 I did find that these eyeshadows tend to overblend a little, so I prefer using very precise small brushes to map out where I want which shades to stand out on my eyes followed by minimal blending. I packed on the lightest khaki/gold shade from the Malachite & Améthyste palette on the inner part of the lid with a wet brush (I always spray MAC Cosmetics Fix+ on my brush when I do this) and then defined the crease and outer corner with the darkest plummy shade. I wanted a little more depth in the darkest shade, so I applied the middle purple shade on top of the plum for extra definition. In the inner corner I applied the lightest highlighter shade to brighten. The sparkles and high shine comes out a lot more when applying these wet, so I definitely recommend using these wet for the best results. I know it's a little extra work, but this palette does require it.. The lipstick does live up to its name Rouge Agate Sheer & goes on pretty sheer. It confused me a little upon first application because I hadn't figured out it was supposed to be a sheer formula, I built it up to the medium coverage you see in the picture and kind of felt a little hungry for more. 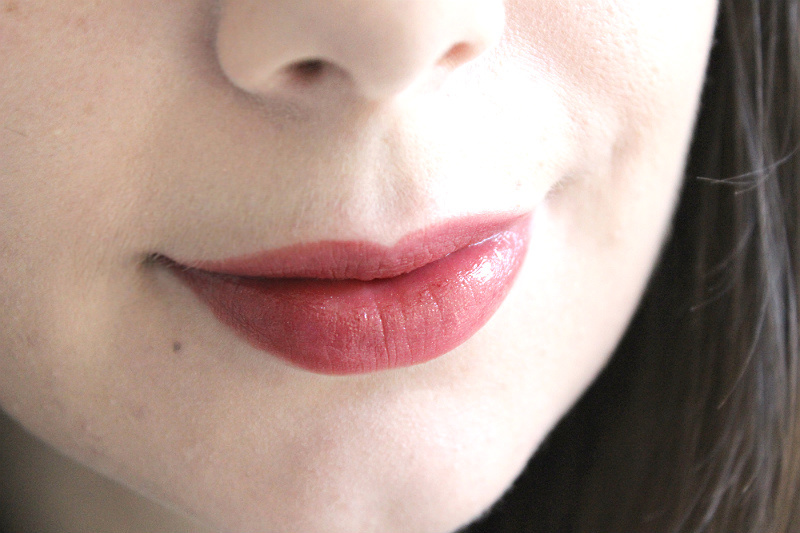 It's a great everyday slightly shimmery brown/pink lippie for anyone who doesn't feel comfortable sporting opaque lipsticks during daytime, but it's probably a little too safe for evening looks. The formula feels quite balmy and wears for a couple of hours before reapplication is needed. Although it's a great lipstick that I'd certainly wear to the office, I perhaps would've expected it to be a little denser in pigmentation to compliment the rest of this bold & evening chic collection.